Almost 20 years ago, when Kevin Costner’s Waterworld rolled out into theaters, it was already epic – not necessarily for its post-apocalyptic science-fiction, but because filming on sets built on water made it the most expensive movie in history. Expectations of a box office hit were high. As it happened, critics neither loved nor hated it, and attendance was mediocre. After such pre-release fanfare, news reports predictably derided the film as an epic failure. 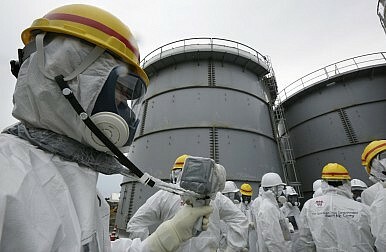 Today, we are suffering a different type of Waterworldproblem at the stricken Fukushima Daiichi Nuclear Power Plant, where the taming of water – in this case, radioactive water containment – is being met with a flood of negative news reports of leaks and being answered with ballooning budgets. Of course, the situation at Fukushima is not a Hollywood film, and the stakes are enormous. Still now, two-and-a-half years on from the initial disaster, the water at the nuclear plant has yet to be tamed. The site is awash with continuous underground flows and rainwater, becoming tainted by radioactive matter on their passage through the area. This poses a massive problem for the containment effort. The response has been to furiously build more water storage tanks, but more tanks also inevitably mean more leaks, which in turn lead to greater public outcry. The government clearly recognizes this is an unsustainable path and continues to take action (and spend money) to slow the increase of contaminated water. Eventually the water must be discharged, and decisions are looming as to how much and when. These decisions demand public engagement, and for that, understanding the different water issues is crucial. The recent rash of headlines – about radioactive leaks, exposed workers and contaminated fish – paints a bleak picture, but to be fair all is not bad. The situation is less dire than many headlines suggest, and Prime Minister Shinzo Abe’s declaration in September to the International Olympic Committee that things are “under control” is a legitimate claim. The tremendous recovery efforts have garnered little attention because much of it is going well. Stabilization of the nuclear fuel has so far been successful. This is the highest priority of containment efforts since overheating could result in another huge environmental release. The fuel in the reactors, as well as those in the spent-fuel pools – most notably spent fuel pool #4 – has been stable since the fall of 2011, primarily because of the effectiveness of the makeshift cooling system. (Additionally, a major effort is underway to transfer the rods from spent-fuel pool #4 to more suitable, worker-accessible facilities). Moreover, the natural radioactive decay means that the fuel’s potential for overheating has and will continue to diminish over time. Other substantial efforts to contain contamination have also met with some success: filtration systems and building coverings close off airborne pathways; and the re-suspension of radioactive dust particles into the air have been minimized by fixatives. Even efforts to contain the huge volumes of contaminated water in difficult conditions have been somewhat effective; the majority of the water is now held in the basements of the buildings, various trenches, and hundreds of purpose-built tanks and cisterns. But this patchwork effort of containment is struggling as it is being constantly challenged by the relentless natural forces of groundwater and rain. As the volume of contaminated water continues to grow, and as stories of spills and leaks pile up, one wonders for how long it will remain possible or sensible to try to contain (and retain) all that water. This brings us to the problem of the day: the escape of tainted water. While frequently lumped together as the same problem, there is a considerable difference between the contamination being carried away by groundwater on the one hand, and the leaks and spills which occur from tanks on the other. Naturally produced water effects – such as those from the ground, rain or tides – usually present relatively low concentrations of radioactivity if contaminated, but come in very large volumes. Leaks from facilities such as tanks or processing systems typically involve lower volumes but higher concentrations of radioactivity. As we will see, both present different challenges and require different solutions. The stricken reactor buildings are interconnected by underground conduits, tunnels and trenches, providing numerous pathways for the water to move. Robotic videos have shown clean groundwater leaking into the buildings’ contaminated basements from at least one of those pathways, increasing the volume of water that becomes tainted and must be retained. The amount of water in the system grows by some 400 tons per day, equal to the carrying capacity of about 13 large gasoline trucks. However, this volume is only the net inflow. Recent radioactivity trends in groundwater samples suggest leakage is occurring out of the basements and trenches and into the ground below. As groundwater migrates towards the sea, and as tides rise and fall, some of this leaked contaminated water is carried away. In August, Tepco concluded that this leakage appears to have been going on since the initial accident, constituting the single largest source of continuing contamination entering the environment and migrating to the harbor. Rainwater is also a complicating factor. Because dripping pipes and puddles are the key indicators of tank leaks and require investigation, wet weather creates a great deal more work. Moreover, the additional water must also be monitored and controlled. Twice this autumn, heavy typhoon rain filled dikes around the tank farms to the brim, and if shown to be contaminated, albeit dilute, had to be retained. The tanks are another issue. Nearly 1000 storage tanks and a massive web of connected piping already groan with enough water to fill 120 Olympic-size swimming pools, with more being built to accommodate the continuous inflow. Building and managing such a vast array of storage tanks involve a colossal effort and, not surprisingly, leaks have begun to appear.